Shimane prefecture (島根県, Shimane-ken) is a Japanese prefecture in the Chūgoku region of the island of Honshu. The capital is the city of Matsue. 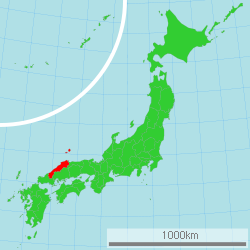 It has the second smallest population of any prefecture in Japan. Shimane Prefecture is part of the San'in area. San'in means "the shady side of the mountains". There is a mountain range separating Shimane and neighboring Tottori from Hiroshima and Okayama. That means that the weather here is much wetter than further to the south. 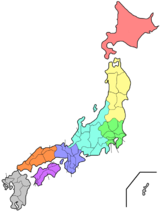 The area of Shimane Prefecture includes the old provinces of Iwami Province, Izumo Province, and Oki Province. The history of Shimane starts with Japanese mythology. In these myths, the Shinto god Ōkuninushi lived in Izumo, an old province in Shimane. Izumo Shrine honors this god. Later on in the Kamakura period, the Kamakura Shogunate forced Emperor Gotoba and Emperor Godaigo into exile on Oki Island. Emperor Godaigo got away from Oki and successfully fought back against the shogunate. During the Muromachi period, many clans fought over this area because there was a lot of silver. The Kyogoku clan controlled Izumo and Oki. However, after the Ōnin War, the Amago clan in Gassan-Toda castle increased in power, and the Masuda clan controlled Iwami. Iwami Ginzan Silver Mine was in between Amago clan territory and Masuda clan territory, so there were many battles between these lords for the large amount of silver. However, in 1566 Mori Motonari conquered Izumo, Iwami, and Oki. After over 30 years of Mori control, in 1600 Horio Yoshiharu entered Izumo and Oki after the Battle of Sekigahara which Mori lost. Horio Yoshiharu decided to move and build Matsue Castle instead of Gassan-Toda. The castle was completed soon after Yoshiharu's death. Later in 1638, the grandson of Tokugawa Ieyasu, Matsudaira Naomasa entered the castle because the Horio clan had no heir. Matsudaira's family ruled until the end of the han system. The Iwami area was split into 3 clans. The mining district was under direct control of the Shogunate. The Hamada clan and the Tsuwano clan each controlled their own areas. Iwami Ginzan produced silver and was one of the nation's largest silver mine by the early 17th century. The Hamada clan was on the shogunate's side in the Meiji Restoration, and the castle was burned down. The Tsuwano clan, despite the Matsudaira (relative of the shogun) rule was on the emperor's side in the restoration. Shimane faces the Sea of Japan on its north. Its southeastern border meets Tottori Prefecture, Hiroshima Prefecture and Yamaguchi Prefecture. Matsue (松江) - The prefectural capital city, Matsue has an original castle. Most castles in Japan have been rebuilt in modern times. Lafcadio Hearn lived and wrote here. Izumo (出雲) - Site of Izumo Taisha, one of Japan's most famous shrines. Hamada (浜田) - Fishing port and recreation area. Tsuwano (津和野) - This is also called "Little Kyoto". Mori Ogai was born here. Masuda (益田) - The westernmost city in Shimane and long-time home of Sesshu, an important artist in Japanese history. Gotsu (江津) - A small industrial city between Hamada and Oda. Ōda (大田) - Close to Iwami Ginzan and Mt. Sanbe. Yasugi - Site of the Adachi Art Museum. Izumo taisha, Mononobe jijnja, Mizuwakasu jinja and Yurahime jinja are the chief Shinto shrines (ichinomiya) in the prefecture. ↑ Nussbaum, Louis-Frédéric. (2005). "Shimane Prefecture" in Japan Encyclopedia, p. 859; "Chūgoku" at p. 127. ↑ Nussbaum, "Matsue" at p. 617. ↑ 5.0 5.1 古川清行 Furukawa Kiyoyuki (2003). スーパー日本史 Super Nihon-shi. 講談社 Kōdansha. ISBN 4062-04594-X. ↑ "Nationwide List of Ichinomiya," p. 2; retrieved 2012-8-27.